Editor's note: This blog was written by Enough Project Intern Anna Philibert. 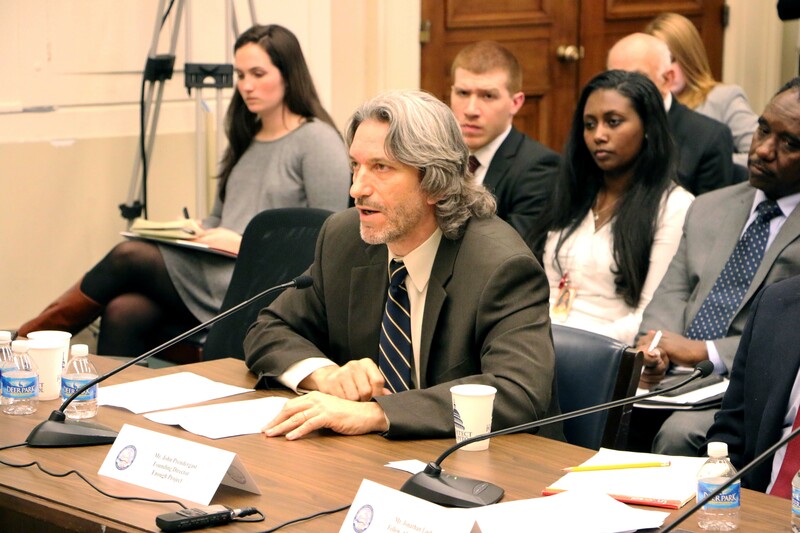 On March 4, John Prendergast testified before Congress at a hearing held by the Tom Lantos Human Rights Commission: “Human Rights Violations in Sudan,” about the need to create leverage over the government of Khartoum to support human rights in Sudan. Commission Co-Chairs Jim McGovern (D-MA 2) and Joe Pitts (R-PA 16) opened the hearing. Chairman McGovern reminded the audience that this marked the fifth hearing on human rights violations in Sudan since the commission’s founding in 2008. Representative Pitts added that the situation has deteriorated to levels of violence similar to 2004. In early 2015, the United Nations estimated that 6.9 million people are in need of humanitarian assistance in Sudan. Jonathan Loeb, Fellow with Human Rights Watch. In addition to Chairmen McGovern and Pitts, Representatives Jan Schakowsky (D-IL 9) and Sheila Jackson Lee (D-TX 18) attended the hearing. On the first panel, Steven Feldstein spoke about his recent trip to Sudan, where he met with government officials, international aid workers, and members of civil society. People he met specifically mentioned their knowledge of the work of advocates, including the recent New York Times Op-ed, written by the Satellite Sentinel Project’s founders, George Clooney and John Prendergast, and Enough’s policy analyst Akshaya Kumar. Catherine A. Wiesner discussed the challenge it is for aid organizations to get access to the millions of people in Sudan who rely on their work. The recent bombing of a MSF hospital and restrictions on investigations of humanitarian violations have made it increasingly difficult for international organizations to access conflicted areas. Opening the second panel, Tom Andrews urged Congress to expand and strengthen the effectiveness of sanctions on those who commit human rights violations in Sudan, to demand accountability from individuals and nations who aid President Bashir, and to introduce legislation that creates a comprehensive approach to the human rights violations in Sudan. Jonathan Loeb shared stories from a recent Human Rights Watch report on Sudanese soldiers who systematically raped 221 woman and girls in the north Darfur town of Tabit. Following Prendergast’s testimony, Representative Schakowsky asked if there are corporate and private sector actors whose actions should be exposed, and Prendergast noted international banks, citing the precedent for action set by the record $8.9 billion fine against the bank BNP Paribas for its illegal transactions with Iran. Read John Prendergast’s written testimony here. Photo credit: Erik Leaver, United to End Genocide.